Philadelphia has the energy and amenities of a big city, yet maintains the close-knit feel of a small town thanks to its unique and walkable neighborhoods. Strategically located at the heart of the Northeast Corridor of the United States, it’s the second-largest city on the East Coast and a leader in developing and attracting top talent, with a regional workforce of 3 million. As one of the city’s top employment centers, the Navy Yard is directly connected to the talent, education, art, culture, science, entertainment, food, and history that makes Philadelphia so desirable. 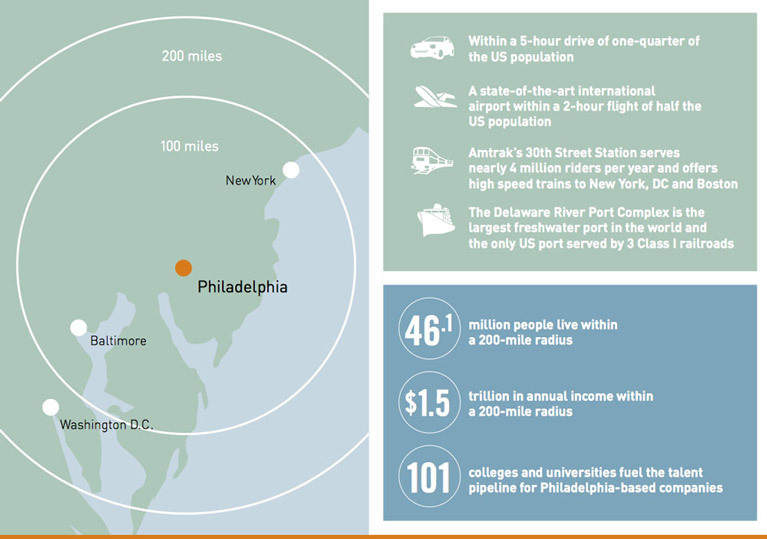 Midway between the nation's financial capital and its political capital, Philadelphia enjoys prime strategic location. The city is within a five-hour drive of one-quarter of the U.S. population, and its booming airport, an expansion-minded port, and enviable rail and highway connections link the city to a huge regional market and the world. Living and working in Philadelphia means enjoying its impressive waterfront; brilliant downtown; many affordable, vibrant neighborhoods; and hundreds of cutting-edge restaurants and retail options. Locals and visitors also enjoy historic landmarks, world-class museums, theaters, and other arts and culture venues, peaceful urban parks, and walkable streets with unique architectural vistas – and let’s not forget the greatest professional and amateur athletic teams anywhere! Philadelphia’s diverse regional economy is anchored by more than 101 award-winning colleges and research universities, sophisticated life sciences and healthcare industries, and a deep pool of talent. The city is strongly supported by a corporate culture that highly values civic engagement with the public sector, particularly in the continuing development of our smart, skilled workforce. 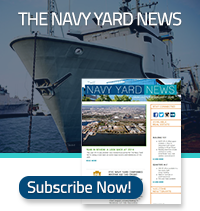 Companies seeking anything from historic small office space to iconic corporate headquarters to customizable R&D space unlike anything else in the region can participate in the continued growth of the Navy Yard. The Navy Yard has a variety of leasable spaces with room to accomodate up to an additional 10 million square feet of development.